Finnish PURTENANCE are one of Death Metal pioneers in the finnish scene since their inception in 1989. Their debut album “Member of Immortal Damnation” is actually considered a milestone within the heaviest and most brutal Death Metal releases coming out from that country. After 20 years of silence, the band returned in 2012 releasing an EP and two albums getting back the recognition they never lost and despite of having played only one show abroad (Spain 2013), it is now with their new line up, when they’re decided to conquer the old continent and one of the best scenarios to do it is the mighty OEF!! 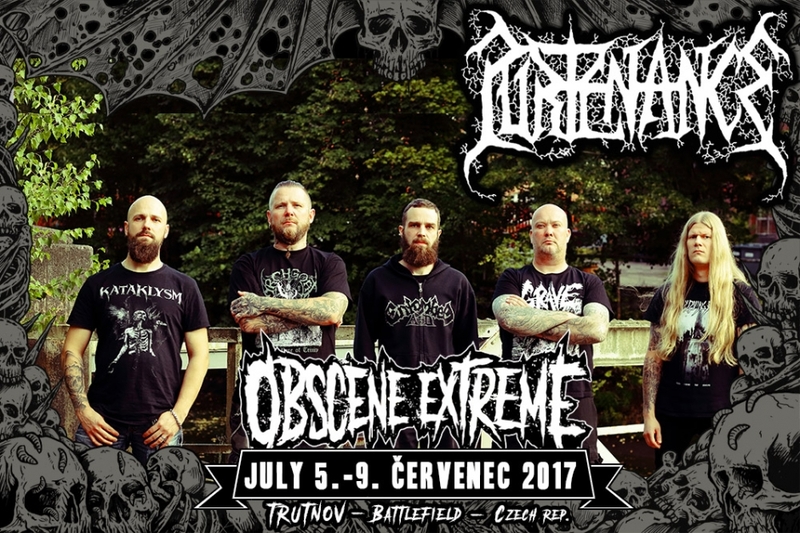 PURTENANCE is definitely carrying the flag of the most honest, classic and heaviest Death Metal the way it was meant to be!!! PURTENANCE is a Finnish band born in Nokia, under the initial name ofPURTENANCE AVULSION in 1989, the name under which they recorded their selftitleddebut demo in the year 1990 and right after the demo, they decided toshorten their name into PURTENANCE. The following year (1991) they recorded ademo that would become a 7"EP for Drowned Productions, property of Dave Rotten(current owner of Xtreem Music and vocalist in Avulsed), following the same path oftheir previous demo. The EP "Crown Waits the Immortal" (cover art by LuxiLahtinen) saw the light in September of that year in a limited edition of 500 copies. Dave, happy with the band, made an offer to them for their first full length, whichthe group gladly accepted, as he pretty well sold this EP and not only because ofthe promotion it meant, but also because of the quality of band and their compositions. Now the band ready to become a bigger act (and possibly less valued in it’s time! ),entered MDM Studios to record and mix "Member of Immortal Damnation", stilltoday being considered one of the best Finnish Death Metal albums of early 90’s,with cover made by great genius of the pencil and oil Chris Moyen (Nominon,Incantation, etc ...) dark and blasphemous as few rarely been seen with apromising future and a couple of good jobs to cut through the wave of groups ofthat time. After this album, band went into hibernation, due to other things in life. In 2011 Xtreem Music did an CD re-issue of "Member of Immortal Damnation". Thissame year, PURTENANCE decided to reform as a trio with original members JuhaRannikko (guitars) and Harri Salo (drums) plus new member Ville Koskela on bass& vocal duties. They started to write new material and a new mini CD came out insummer 2012 entitled “Sacrifice the King”, again with artwork by Chris Moyen andreceiving a big welcome from the scene. However, this EP got mixed feelings amongst fans, but this didn’t stop the bandwhich not only continued working on new songs, but also added a second guitaristcalled Ville Nokelainen and started to play their first shows after 20 years at thesame time they were recording their long awaited second album ”Awaken FromSlumber” released in October 2013 through Xtreem Music coinciding with the veryfirst show of the band outside of Finland at the Ritual Zombi Fest in Madrid (Spain). “Awaken From Slumber” showed the heaviest and darkest sides of PURTENANCEever, this time getting an awesome acceptation amongst their followers! !After the release of ”Awaken from Slumber”, PURTENANCE also activated to domore live shows. After these performances, sharing the stage with such bands asAmorphis, Finntroll, Avulsed, Dissect and many more, PURTENANCE started at late2014 to write and record new material. In October 2015 came out their 3rd fulllength, called ”…to Spread the Flame of Ancients”. This release was more focusedthan the other new releases and flashed some echoes from the past, with twistsfrom all the current members. Again PURTENANCE headed to play more and morelive shows. Participating in autumn of 2015 to one of the most unique festivals inFinland (and in world), PURTENANCE played at ”Finnish Death Metal Maniacs Fest”in Pori. This show featured from original lineup, vocalist Timo Häyrinen, performingsongs of his era, for one last time!. There were so many legendary acts alsoplaying, that it almost felt it was the 90’ again! After Pori, PURTENANCE performedat Turku, in ”Turun Kuolema” festival, that also had some unique acts playing.In the end of 2015, Ville Nokelainen left the group and two new members steppedin. As Ville Koskela started to focus only to vocals, Simo Rouvinen (Blackvenomfrom Flame) and Tero Aalto begun to handle the duties of second guitar and bass. As 2016 is starting to end, PURTENANCE has inked a new deal with Xtreem Music torelease more new material, booked more and more shows and started to write newmusic, when 2017 will come, PURTENANCE will be stronger and brutal than ever!